If you’re entering the market for your next vehicle, then you understand firsthand how difficult it can be to narrow down your options. The automotive market is flooded with choices, which is why our team here at Certified Autoplex is working to breakdown the differences between some of the most popular models. That way we can provide driver with the information they need to make a more educated decision on their next car. Here at Certified Autoplex, the majority of our inventory focuses on pre-owned luxury vehicles. We don’t carry new models on our lot, so the rest of our inventory is made up of mainstream brands. 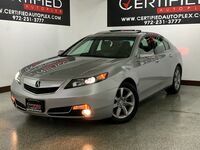 This time around we’re going to highlight our used Acura models that are available to drivers in the Dallas, TX area. We’re located in Carrollton, which is just a short drive outside of Dallas. Acura is the luxury brand for Honda, and it is one of the more popular brands on our lot with about ten models to choose from on average. It’s important to note that our inventory is constantly changing, so be sure to double check with us before heading to our lot for a model mentioned here. The Acura models we have in stock now range from 2010 to 2014 with an emphasis on sedans such as the Acura ILX and the Acura TL. Drivers in the market for a larger vehicle that offers more space for both passengers and cargo may be interested in either the Acura RDX or the Acura MDX. The Acura RDX is the smaller of the two with seating for up to five. The Acura MDX is the next step up with seating for six or seven depending on the model. Some of the available features across the board include leather heated seats, navigation systems, keyless entry, Bluetooth and rearview cameras. More information regarding our inventory is available by contacting our team here at Certified Autoplex. We’re more than happy to answer any questions you may have, so please don’t hesitate to ask. Those looking to get behind the wheel of an Acura vehicle can do so by scheduling a test drive online today. Interested in a Used Acura Dallas?